At Marigold Works our capabilities are truly endless. From complete rebuilds to custom fabrications. Our comprehensive capabilities make us an efficient partner for many of our clients who utilize our various departments and specializations. Our on-site logistics department makes it easy for us to accommodate customers across the globe. Developed in 1986, PermAlloy® is a trademarked custom overlay process developed by and available exclusively through Marigold Works. 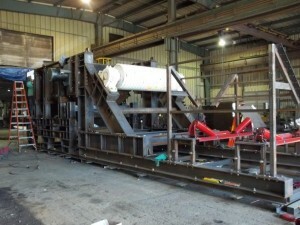 Originally designed for sheaves and pins on draglines and shovels, our proprietary overlay process is the most cost effective rebuilding process on the market. PermAlloy can be applied up to ½” wear depth, has a Rockwell C rating of 52-55 entire depth, and work hardens to 60+ HRC. Our new PermAlloy sheaves are manufactured from one solid steel forging with no welds in the structure of the sheave and outlast flame-hardened sheaves by at least 2 to 1 and extend the life of wire rope by up to 40%. Our PermAlloy pins and our PermAlloy fairlead guide rollers outlast OEM 3 to 1. Our machine shop is where it all started 40 years ago when Marigold Works was founded. From overhaul and repair to elaborate manufacturing, Marigold Works has the infrastructure and staff to handle all of your manufacturing, welding and fabrication requirements. We are committed to excellence in the production of leading edge, high quality, cost effective products and timely, professional service. Our machining capabilities combine the proven precision of CNC technology with production-volume performance. 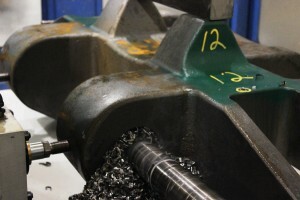 Our extensive in-house resources for turning and milling can accomplish any level of finishing. With our vertical and horizontal CNC machining centers and CNC lathes we are able to achieve consistent, accurate results on all sizes and types of parts made from bar stock, plate, castings, fabrications, and more. From concept to prototype to production our reliable CNC capabilities ensure exact tolerance and precise results on all size components. Whether simple or complex, Marigold Works supplies you with consistent quality machined parts- every time. Our fabrication department specializes in fabrication and installation of industrial custom components, structures, and miscellaneous metals. 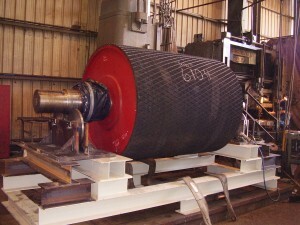 We specialize in medium to large weldments and welding repair services. Our fabrication capabilities range from made-to-order component production to complete custom assemblies. To help you avoid costly downtime, our repair/rebuild service makes sure big pieces of equipment are back in operation as quickly as possible after failure. 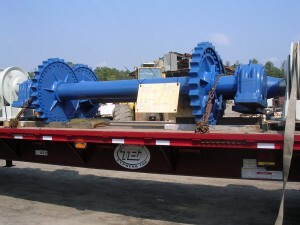 We provide a turnkey resource for worn and broken parts as well as manufacture of new, made-to-order replacement parts. Our quality-enhanced processes can provide a superior return on investment by reducing downtime and extending life expectancy. Our rebuild service includes inspection, disassembly, repair, reassembly, re-inspection and testing to ensure the part is fully operational. Throughout the repair or rebuild process, we employ stringent testing, analysis and monitoring to eliminate defects and insure adherence to design specifications. 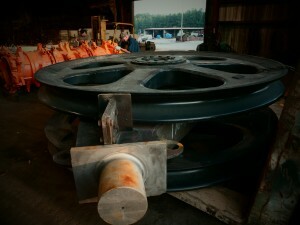 Marigold Works has on-site logistics capabilities. This makes it easy for us to ship to and from our customers across the world. This international supply chain service is committed to being the most comprehensive one-stop supplier for all of our customers’ needs by delivering unparalleled customer services and provide options for every stage of the supply chain.